I loved reading this! Thank you for sharing. My grandmother and aunt are buried there. Also a couple of former classmates. Just wanted to say thanks for sharing this interesting history of Boynton. I have always thought you could learn about a place thru a walk thru the local cemetary. My grandma told me that. It looks like a rather fancy and expensive marker for such a man with a meager income that left a widow with children. Thank you for the comment. We noticed the marker is quite expensive looking and echo your sentiments. We will continue to comb through the old newspaper accounts and inquire with the cemetery sexton as to who may have paid for the marker an/or when it was installed. 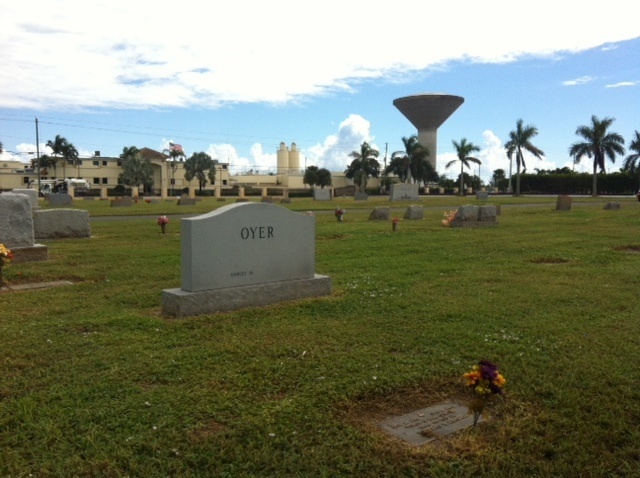 At the time of the tragedy, fewer than 100 people were recorded as living year-round in Boynton. There was no organized government, no formal church, no local doctor, and no hospital. A possible explanation is that the townsfolk came together and raised the monies for the marker. 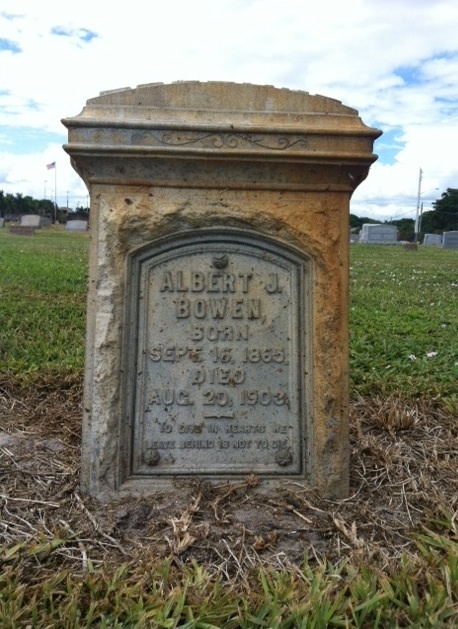 Perhaps one of our readers may supply an additional clue as to who funded Albert P. Bowen’s tombstone. Is this the cemetery on the north part of town? I have family buried in both, but I have a brother in that one. 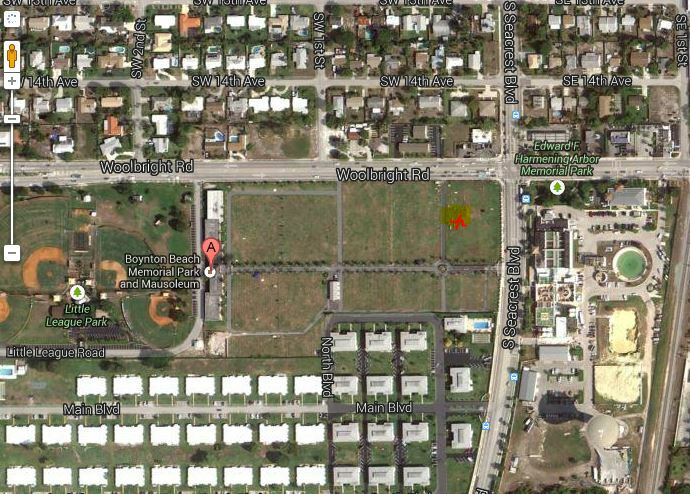 The cemetery where Albert Bowen is laid to rest is located on the southwest corner of Woolbright and Seacrest. I’m adding a map to the blog so others may reference the location. So tragic, for him, wife, and daughters. Nice of you to take the time to search, and write his story. By doing so, what is printed on his memorial, is true, he’s remembered, again, by everyone reading this. That was fascinating. Thank you for taking the time to publish your research on it. I really enjoyed it. Funny, my grandfather had the same migration to south fla, met his wife in Canada, moved to Detroit, where my father was born, the moved to Ft. Lauderdale to be a lineman for ma Bell… wonder if I’m related somehow…thanks for the interesting story! Very interesting Rob! Albert had five brothers – perhaps you are a descendant of one of the brothers or have a common ancestor. Let us know if you find any connections. Another fantastic story told because you are so curious about the history of our area. You are a treasure that Boynton Beach is fortunate to have. I am thinking I would love for you to flesh out the untimely deaths of two of my relatives, Nellie Austin Lyman and Fiona Austin. Thanks for all you do. It is fascinating stuff. Great, interesting & sad story. Amazing how much info you are able to find, Janet, once you zero in on a topic! Thank You for providing so much interest on Boynton history for all of us! There are so many stories we can learn from. If only we had time to properly document more of them. I have a list of many ‘little known’ people to research. I’d especially like to give a voice to some of our early African-American and Bahamian-American settlers. Thanks for this great article about a man who would be forgotten if not for you. I enjoyed the article …great account! Thank you Michelle! We appreciate you and your commentary. Please join us at one of our upcoming meetings and feel free to email us at boyntonhistory@gmail.com. How did you find all of this information. Is this available at the Court House? Such a rich history.